Often times when I’m working I’ll be listening to an album or podcast, sometimes having a documentary related to what our current project is playing in the background. However, every now and then I’ll throw my headphones on and hours will pass and I realize I hadn’t been listening to anything at all. It’s those times I find myself getting “in the zone” easiest and for the longest periods of time. I’ve found that a way to help myself concentrate is to have the best of both those worlds by listening to a white noise generator of sorts. Rain and thunder off in the distance, a bubbling brook, rustling leaves or a fireplace popping every now and then. There are a couple sites I go to for this. The first is a very simple and easy to setup website called A Soft Murmur. A more complex and expansive website is MyNoise. These sites have really helped me with concentration, and it sure beats listening to silence through headphones. Since joining the team here at Morehead, I have been blown away by the potential of “The Dome” as a medium for presenting content. 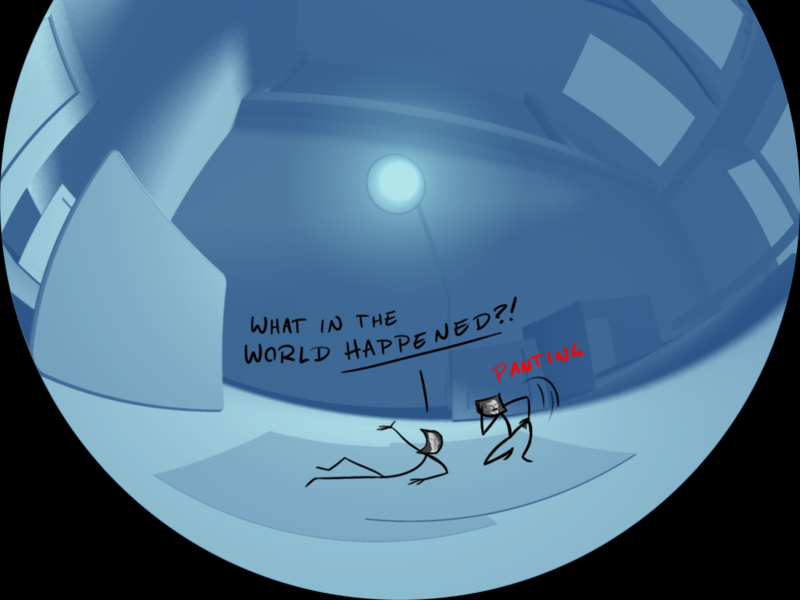 With the rise in popularity of creating spherical content for VR and Immersive Video, I think there will be more and more variety in the type of content that is being created for domes. On the technical side, we have been evolving our pipeline for 3D production to allow us to move away from Mental Ray for Maya and adopt V-Ray as our primary renderer. (Stay tuned for some more info on that…it’s an amazing tool!) We have also added a few plugins and scripts to our tool-box, most notably Peter Shipkov’s SOuP (www.soup-dev.com) and Open VDB Toolkit (http://www.openvdb.org). With all of these changes and additions, we needed to come up with a way to easily manage plugin installs across our user machines and the render farm. The ideal solution for us was one that allowed us to install plugins and scripts to a single network location that all machines pointed to. The standard approach for single users is to just install what you need on your local machine. But this can quickly become a mess when more than one artist is working on a project. Of course having a render farm makes things even more complicated. Unfortunately, many places just go without many useful tools or updates because the install/update process can be such a time-sink. But from my previous experience I know it doesn’t need to be a big deal to add and update tools. I know this post may not seem like a thrilling artistic explosion. But the value of a bit of laying a bit of pipeline can allow you to work much more efficiently. Give it a try, even if you have no experience with this kind of tinkering. You’ll be amazed how easy it is. Maya looks at this file when it loads and this can be used to define additional paths for scripts and plugins. By default, this file is empty, hiding how useful it can be. But a quick look at the Maya help documentation outlines the way that this file can be used to create a more flexible setup for your work. SHARED_MAYA_DIR = \\<<network location>>\Maya_Content - This is a user defined base directory for additional maya content. 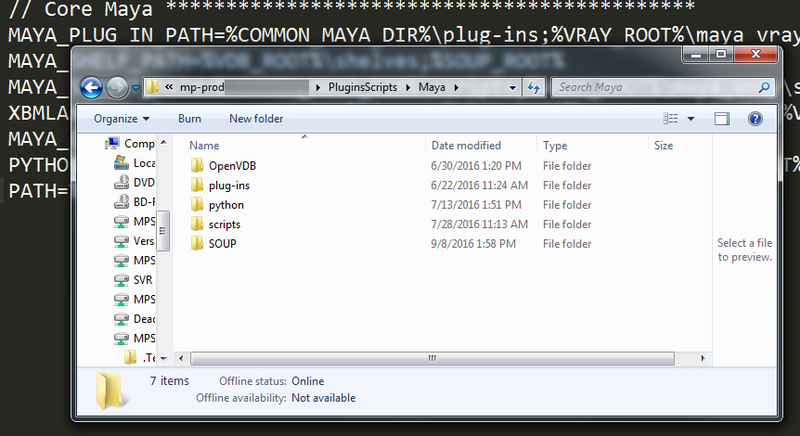 MAYA_PLUG_IN_PATH = %SHARED_MAYA_DIR%\plugins; - This is another standard variable that Maya uses to browse for plugins. Using the same base directory, we can store them in a common location to easily update for all users. 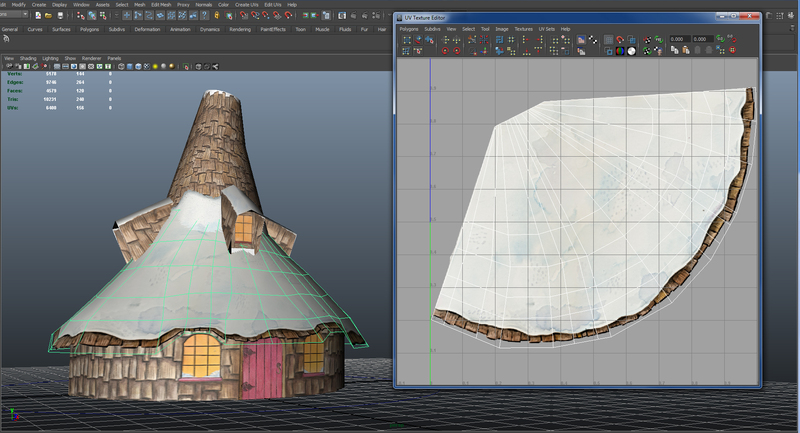 There are many different standard environment variables that Maya can use to load different content. The variables that we’ve been focusing on are the ones in the File Path Variables section. But there are tons of useful paths that are worth a look. With this in place, we are able to update scripts and plugins as needed while staying out of the standard Maya directories. We can even update our Maya installs and not need to re-install any scripts or plugins if they are compatible with the Maya version. The only file that needs to be moved around is the Maya.env file. This brings us to the final piece of the puzzle. Managing a master Maya.env file and be able to update this file on multiple computers. I wanted to be able to update a single master Maya.env file and have it instantly updated on all user computers and the render farm. This would minimize the workload for the systems team and allow us to add and edit our tools as we needed. I came from working in a Linux production environment where we used something called a symbolic link or “symlink”. This A symlink creates a file at one location on a computer or network that reads data from another location. To the computer, it treats it like the actual file. But on the management side, it allows multiple dynamic copies of a single file to exist. This is not the same as a standard windows shortcut. Shortcuts are actually a file of their own, a .lnk file. So those wouldn’t work for the type of functionality we need. 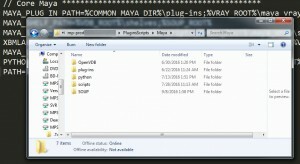 Maya is looking for a file called Maya.env. It doesn’t know or care the the Maya.env file it is finding is, in fact, symlinked to another file on the network. Our more computer savvy readers may already be shaking their heads at the methods we are using, hopefully this is good for a laugh at least. This method works great for us. This is run from the command prompt, or just put something like this in a text file and save it as a .bat file. Double click on the .bat file to run it. That’s it. I know. Kind of anti-climatic. But once the link has been created, you can edit the master file and all of the linked files will update. We created links on all of the farm machines and now hopefully we won’t need to do any manual installs on multiple machines except in the most extreme cases. In my next post, I will talk about making cool images…but this was a big step for us here at Morehead and we wanted to share it with you. Since Ben Fox has started working with us, I’ve learned a lot. One thing I learned is that I’ve been doing things the hard way (or at least terribly inefficiently). One of the tools he introduced me to is UV passes in Maya. UVs are just floating numbers between 0 and 1 that designate what pixel should be seen where. It’s for that reason that you don’t necessarily have to apply textures to your models in Maya. You can just apply the textures in your compositing software (in our case After Effects). There are some limitations with this method, such as reflections or final gathering that would be calculated when you add your texture in After Effects, but for simple things it works very well. 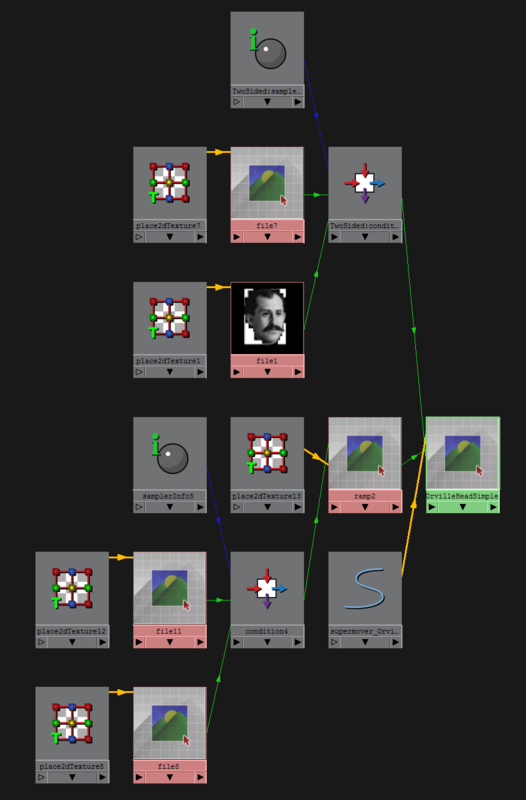 In the past I would output an image sequence for an animated texture to bring into Maya, but by using this method I can just apply it to the UV output that was set up in Maya. How do you apply a UV pass in Maya? Apply this shader to any object of your choice (which was quickly put together by Ben for me). Then rendering with a 16 bit or higher image format that allows you to bring the sequence into After Effects and apply your own texture using this effect made by François Tarlier called ft-UVPass.Be sure that your Project Settings in After Effects are set to 16 bit as well. Excelsior! 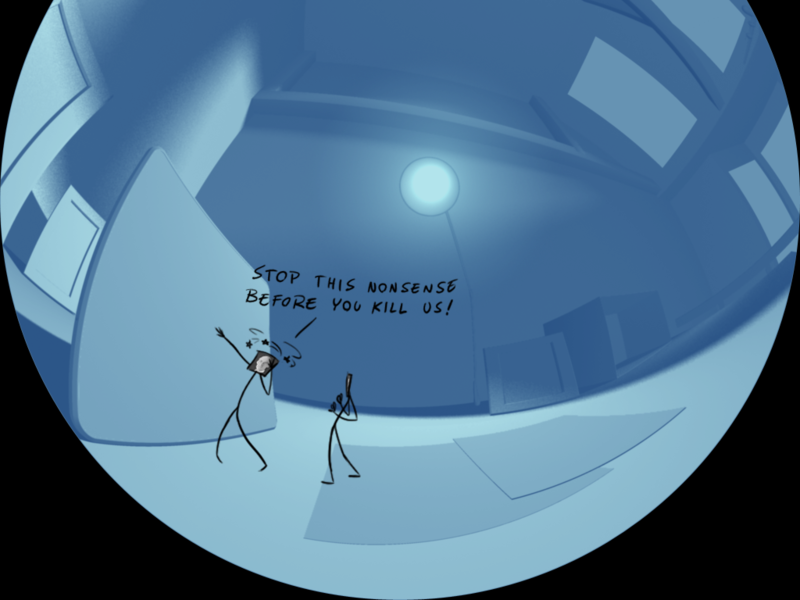 With the bodies modeled as pencil lines/sticks, it made skinning the character much faster. The faces are animated in After Effects with simple animations compared to Grossology and You. A major problem that happened with Solar System Odyssey was spending time creating hundreds of blendshapes between the three characters, only to not use them in actual production due to time constraints. The way I rigged the face was using the same technique from Grossology and You, albeit much simpler. Since a bit of the charm is the crudeness of a cut-out, the only secondary motion I added was on Orville for his mustache. One of the concerns of going with stick figure characters was the arms/legs getting lost when passing in front of other parts of their bodies. I had to do some careful staging when it came to animating, but I made a quick test animation to test the concept. Rigging and texturing the character in Maya was only a little complicated, but not nearly as time consuming as doing the same for the characters in Solar System Odyssey. The most complicated part was rigging the head. I wanted to have control over the twists and bends of the paper head, so I used a lattice driven by clusters and set driven keys. 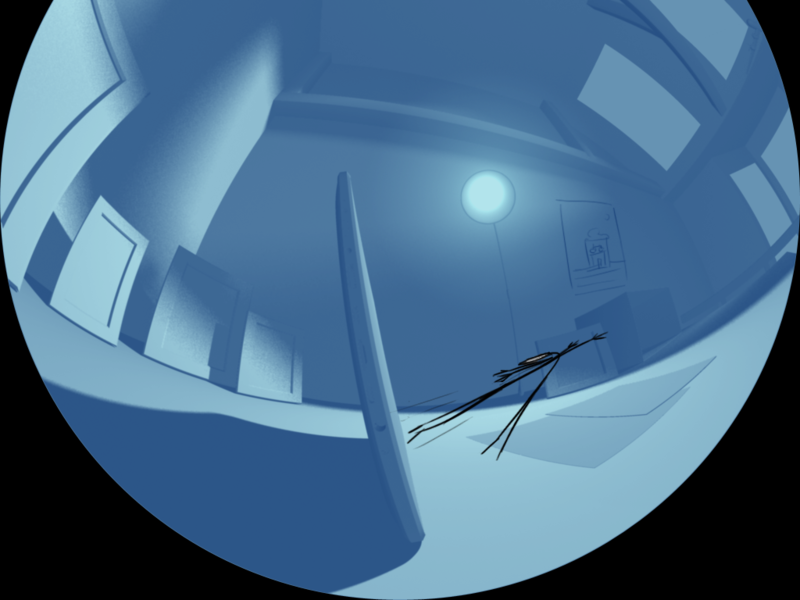 The eyes are animated in Maya, using set driven keys to move the UVs on a sphere that was flattened. The reason I flattened a sphere instead of just using a flat plane was to distort the iris’ shape and speed when approaching the side of the sphere to give a sense of depth. For the faces in Maya, I didn’t want to have two planes squished together for the front and back of the photograph since there would be a good chance they pass-through each other when the head is turned or distorted. The solution for me was to use a single plane and have a shader for their heads use a condition node to show different textures for different sides of the plane. When I hooked up the transparency to the shader it behaved strangely, so I fed it through a ramp node which fixed the problem. Lastly, for a final touch I wanted to help push the idea that they’re drawings and make them a bit more interesting to look at. I made a quick cycle between blendshapes to make the lines wiggle a little and give them a bit more life. I figured it’d also help in case there were any breathing holds I wanted to do down the line. Now on to the animating. The tool I used the most was aTools. It is an immensely useful tool created by Alan Camilo. It has tween machine built in for keying, and made it easy to set up control group pickers for quick selections. You are also able to turn on arcs for your selections to find and fix weird translations. I heavily recommend it. Using the keys < and > I can hop between keyframes, using J for deleting them, K for copying them, and L for pasting them. I also found the hotkey \ useful for zooming in on the viewport without moving the camera. Since sometimes I can’t fall back on using my flat playblasting camera used for animating, I needed to use the fisheye one instead which doesn’t always see everything. At the start of the Grossology and You process, we wanted to make sure I had enough time to animate the characters. We went with a game show type format, which meant we’d need multiple characters representing contestants, a show host, and a character for the audience to identify with. Two ways for us to help lighten the load on my end were to have a limited amount of time we’d see the characters, and to make them very simple in rigging. The lessons we learned through Solar System Odyssey really drove these points home. I spent roughly 3-4 weeks sketching, modeling, texturing, and rigging each of the three characters with The Setup Machine 2 and the Stop Staring method for the faces. Unfortunately, this caused the time allowed for animating to be crunched, and sadly, the work put into the character’s faces was unused along with unpolished body animation. In total, there were roughly 15 minutes of character animation in the show with a minimum of 3 characters on screen at all times. It was from this lesson that we made sure Grossology and You had a significantly smaller amount of time spent with the characters, and they would have only what’s needed in terms of rigging. For Grossology and You, I had the pleasure to work with the artist for the Grossology book series, Jack Keely. Jack sketched up character designs for us, and when they were finalized sent them my way to get rigged. The process for the rigging was mostly straight-forward. I used Dan Gies’ tutorial on Rigging and Animating 2D characters, and adapted it for the simpler drawings (his tutorial also included things like animating bump maps IIRC which I didn’t opt for using). The character’s body (in this case Boogie) was rigged using DuIK. What this allows is the use of DuIK to create the Inverse Kinetics used to control the puppet pins. It also allows for other fun ways to control the character. 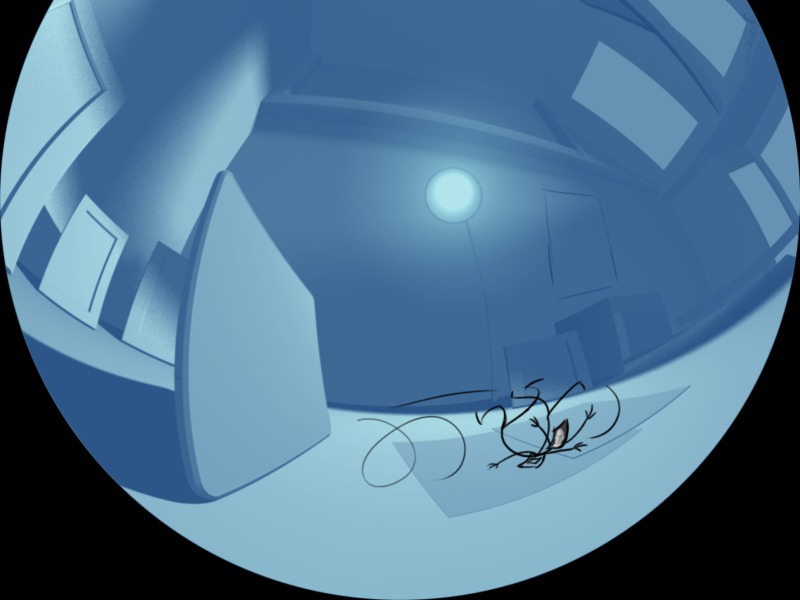 I worried that seeing 2D animated characters on the dome might not be that interesting to watch for long periods of time, so I decided to have a lot of secondary animation to keep it interesting. I also wanted it to be automated for the most part, to help save me time. Using the nulls controlling puppet pins, I could accomplish a very basic sense of secondary motion by having the movement delayed. On my next post I’ll talk about what I did for tackling the characters in our newest show, Take Flight! Just got back from the Fiske Fulldome Film Fest at CU Boulder last week where we screened Grossology and You and The Longest Night: A Winter’s Tale to a crew of fulldome professionals and general audiences. It seems the industry has stepped up their game in general in the past few years. We saw some great shows all around, but leading the pack was National Space Center’s We Are Stars. Not only did it win best show and best soundtrack, but it might have been the best fulldome show I’ve ever seen. Beautiful, engaging, informative and fun. Just a fantastic film. Also great was California Academy of Science’s Habitat Earth. As usual, they started the show with a mind blowing immersive and dense scene but continued on to explore different beautiful environments and scales before moving to the more motion-infographic scenes of the Earth. A nicely done, highly polished show. But overall, there were a lot of good entries. In fact, there were more good shows than I’ve ever seen at a fulldome festival. Hopefully, this trend will continue. BTW, when I told people I was going to a fulldome planetarium film festival in Colorado, most people assumed it would be like the video below. Working with the artists over at Paperhand Puppet Intervention to create The Longest Night was a real treat. Once we were able to explain the possibilities of using their artwork in a digital realm they started to think and adjust their process for creating easily adaptable painted textures. 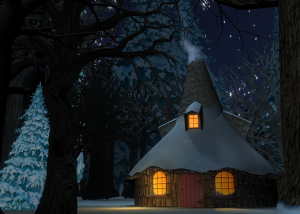 One asset in particular was a cabin in the woods that the “old woman” character lived in. 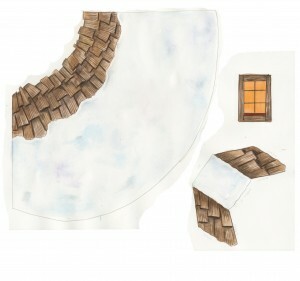 They approached the creation of the textures by building a small paper mock up and then unfolding it before painting the individual pieces. 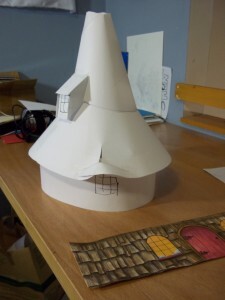 This template was used to create the textures, and even worked as a great reference point for building the final 3D model. After incorporating it in the scene, and lighting it we were able to create a great mood and feel using these excellent painted textures and a little Photoshop manipulation. We finished our latest show “The Longest Night: A Winter’s Tale” in November and it’s now been playing at Morehead for about 2 months. It’s getting a great response from the community. There’s so much demand, in fact, that we’ve had to create extra weekend and weekly showings so we won’t have to turn people away. We’re very happy about this response, of course. “The Longest Night: A Winter’s Tale” is a one-of-a-kind fulldome planetarium show that captures its audience with a timeless fable of courage, generosity and renewal. Its story explores the concept that winter is a time for Earth to rest, waiting for new growth in the spring. Its star, a young girl born into a family of nomadic storytellers, embarks on a simple quest that leads her to a dragon’s nest. What will she discover there, and how will it help her save her village? Morehead collaborated with Paperhand Puppet Intervention to develop the story and visuals of “The Longest Night.” The Morehead production team seamlessly wove together live-action video of Paperhand’s world-class puppeteers with beautiful and intricate fulldome animation to create this innovative and imaginative show. Its cast and crew comprised dozens of puppeteers and production professionals, and The Paperhand Band created original music for the show. We’ve got one more behind the scenes video to share created by our production intern, Paul Davis. In it, Jay Heinz (that’s me) talks about all things related to audio and sound design used in Solar System Odyssey. I promise none of it is in the 3rd person, either. It’s been a while since we’ve updated this blog because we’ve been pretty busy finishing up our latest show, The Longest Night: A Winter’s Tale. More about that in some later posts, but we’ve opened it at Morehead and it’s getting a great response. In the meantime, I just wanted to share a behind the scenes video one of our incredible student interns, Paul Davis, produced. Paul had his hand in many aspects of The Longest Night, from RED camera operator, to rotoscoping to some After Effects animation. In his spare time, he made this video where Peter Althoff, our technical director, talks about some of the tricks involved with dome production that were specifically used in Solar System Odyssey.